Keeping your community safe is important. Just as the police work tirelessly to keep your neighbourhood free of crime and the fear of crime, working together as a community can play a huge role in decreasing crime. Whether you’re going to work, a weekend getaway or a long vacation extravaganza, knowing and building meaningful relationships with your neighbours allows you to leave your house in their care. 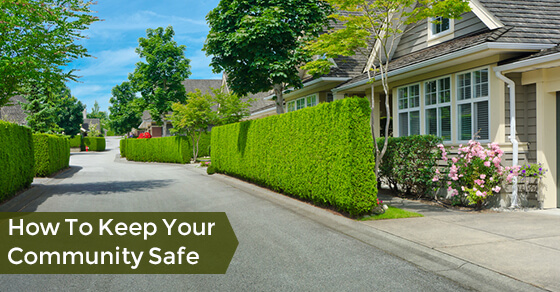 It is good to identify friendly and reliable neighbours whom you can ask to watch your house or leave an extra set of keys in the event of an emergency when you’re away. Communicating with your neighbours creates a sense of community and desire to care for each other. Neighbourhood watch is considered one of the most successful crime prevention initiatives ever. It is based on the simple idea that the best way civilians can take action against crime is by working together as a community. Neighbourhood watch groups promote things like the reporting of suspicious incidents to the authorities, practising crime prevention strategies (such as the use of security systems and property marking) and keeping a close eye on vulnerable households. The buddy system is based on the idea that a criminal is more likely to attack a lone person than two or more people. It applies to everyone, from kids to adults and vulnerable persons. A buddy can be a person who walks you to your car, ensures that your kids arrive home safely, helps you pack in preparation for a solo mission like jogging or cycling or anyone you can call for help in an emergency. It is important to teach kids about bullying, violence and empathy. Encourage your children to resolve conflicts peacefully, to take action if they hurt themselves or see someone else being hurt and to be aware of their surroundings. Thieves and invaders are drawn to untidy neighbourhoods with overgrown trees, bushes and hedges, run-down buildings, abandoned vehicles and litter everywhere. These conditions communicate to burglars that you are not concerned about your neighbours or your environment, making individual homes easy targets. Take control of your environment by cleaning and decluttering in and around your home and then invite your neighbours to join you in cleaning the community initiatives to promote safety. Finally, it is important to stay current with crime trends in your neighbourhood so you are ready to spot and report any suspicious activities. Also, share tips with your neighbours about security systems to deter criminals from your local area. ©2019 Fire Alarm Monitoring Systems & Services - Fire-monitoring.com. All Rights Reserved.